Florence is a travel destination that appeals to groups of all types. Student groups flock to the impressive art and museum scene. Families enjoy roaming the beautiful streets and gardens. There are festivals that draw the young and old alike. Finding group accommodation in the heart of Florence can be challenging, particularly if you're traveling with a large group. It may be necessary to stay outside the city center and travel into town. The surrounding countryside is quite beautiful and the experience is unique, regardless of where you stay. 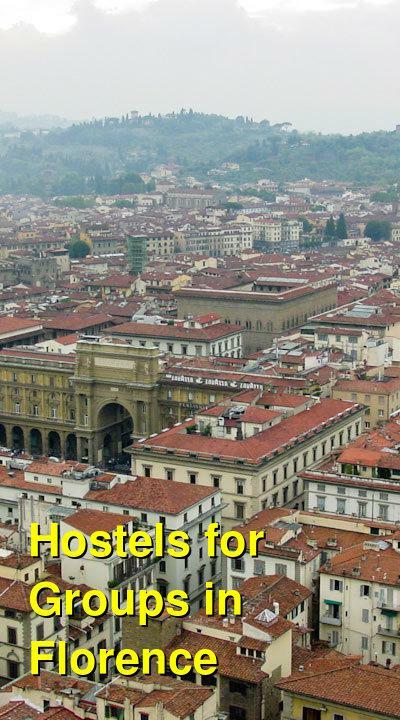 How much do hostels in Florence cost? Bigallo Hostel is located in an old monastery that dates back to the 13th century. The building has been renovated with modern comforts and amenities, but the atmosphere remains unique and historic. The hostel is located outside of Florence, so it is important that your group have some form of private transportation. Rooms include dormitories, alcoves, and private rooms. Dorms are perfect for small or large groups. They sleep between five and eight people and offer storage space by each bed. Each dorm has a shared bathroom and shower. Sleeping in an alcove is a unique experience that you can only have at Bigallo Hostel. There are 20 beds in wooden alcoves. Each alcove has two single beds and shared bathrooms. There are also five double private rooms in the hostel. Each private room has it's own bathroom and shower. Bigallo is equipped to handle large, organized groups. Whether it's a group of students, athletes, or friends, the hostel has an ideal set up. There are both dorms available as well as private rooms for the group leaders, drivers, or teachers. There are also common areas that are large and comfortable where groups can meet for formal discussions or socializing. There is also a Mess Hall where the hostel can prepare lunch and dinners. Take-away lunch boxes can also be provided. This campground is located about five kilometers south of Florence. It looks out over the monastery of Certosa and is surrounded by beautiful hills. The location is relaxing and peaceful and the setting is ideal for trips into Florence, San Gimignamo, Volterra, and Siena. The campground has many unique amenities including a bar, mini market, restaurant, hot showers, laundry facilities, a public kitchen, internet access, a playground and an outdoor swimming pool. The reception staff is available to help with bus tickets or other inquiries. The area is spacious and well equipped to deal with groups. There are large green areas where groups can set up tents or campers. The kitchen facilities allow groups to prepare meals. If you're looking for an alternative to a hostel, then this campground may be a good option. WoW Florence Hostel is a nice hostel that was recently renovated in 2014. The hostel is appealing to young travelers who are looking for a place to relax in a fun and comfortable environment. 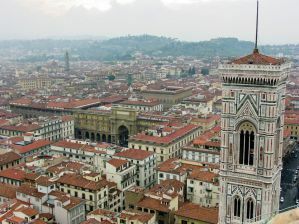 WoW Hostel is located in easy access of the Duomo and many of Florence's top museums and galleries. WoW Hostel has two types of rooms: multiple rooms and private rooms. Multiple rooms have either four, six, or eight beds. Each room has a private bathroom with a shower and toilet. There is also accessibility for guests with disabilities. Private rooms have twin beds and private bathrooms. There are several private rooms that are set aside for families with children. All rooms are air conditioned and are brightly colored to create a fun atmosphere. Common spaces are designed to encourage socializing and mingling with other travelers. There are large terraces as well as a roof garden with views of the Duomo. Whatever your purpose for travel, this hostel is equipped to meet your needs. Hostel Archi Rossi offers a unique atmosphere that takes advantage of the Florence's impressive art culture. Local art students have painted original frescoes in the hostel's reception area. The hostel has a warm and welcoming environment that is appealing to young travelers, families, and groups alike. The hostel is located just a few minutes from the Santa Maria Novella railway station. The central location makes it a perfect option for people who are hoping to explore Florence freely without access to a private vehicle. There are rooms in a range of sizes, from single rooms to rooms with up to nine beds, and everything in between. Some rooms have attached bathrooms, others do not. Other on-site amenities include a bar and restaurant, personal lockers, free internet, common areas, a tv room, an open air terrace, outdoor space, and laundry facilities. The hostel provides free breakfast and affordable dinners. There is also an organized walking tour offered every morning. If you're looking for a hostel in the heart of Florence that really maintains the culture and atmosphere of the city, then this hostel can't be beat. Prices remain quite reasonable as well.